Different sportsmen are motivated by different factors. Some choose to rely on their statistics and performance to prove a point. Others may wait until their hard work is acknowledged and celebrated by others in order to feel accomplished. Raphael Varane may belong to the second camp after what is reported to be his cause of annoyance with Real Madrid emerged. According to AS, the French centre-back, who multiple sources claim is unhappy at the Bernabeu, is said to be particularly peeved at one action of Los Blancos. 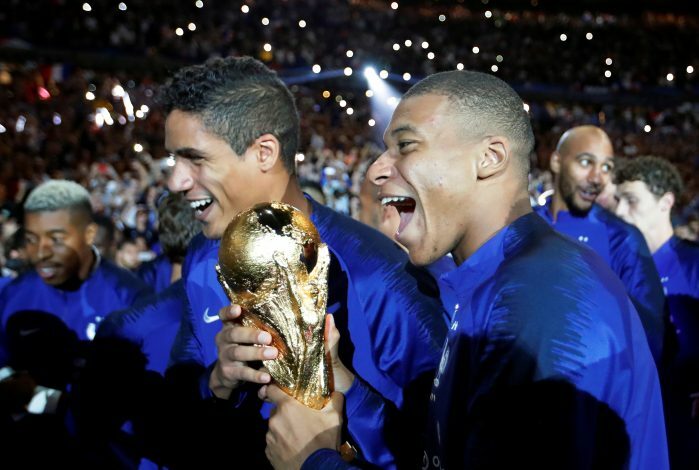 The 25-year-old is believed to be unhappy with the fact that Real Madrid didn’t acknowledge and celebrate his role in ensuring that France lifted the World Cup in Russia in the summer. This feat was reportedly overshadowed by Luka Modric being named the player of the year on multiple occasions, particularly the Ballon d’Or. Now, this may be one of the factors edging the centre-back, widely renowned as one of the best in the business, towards an exit in the summer. The rapport between player and club may be that bad that even the return of Zinedine Zidane may not prove enough to convince the Frenchman to stay. Incidentally, the French gaffer was crucial in securing Varane in the first place, and played a vital role in ensuring that the youngster transformed into the pivotal player that he is today. Madrid may not be that bothered by his choice, considering that there are already murmurs linking them to other big-name defenders. Eder Militao, Kalidou Koulibaly, Jose Maria Gimenez, and Milan Skriniar are reported to be on Madrid’s wishlist in one capacity or the other. Will such a reason truly tip Varane towards exiting the Spanish giants, or will the charm and success of Zidane persuade the youngster to stay on and script another remarkable year come summer?